The two state senators representing parts of Darien in the state Legislature will hold a “community conversation” on Monday from 7 to 8 p.m. at Darien Library. State Sens. 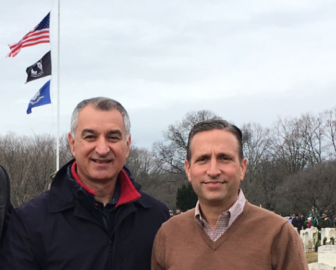 Carlo Leone of Stamford and Bob Duff of Norwalk at the veterans cemetery at Spring Grove Cemetery in Darien on the day when wreaths were laid on graves. Senate Majority Leader Bob Duff of Norwalk and Sen. Carlo Leone of Stamford will talk with constituents and answer questions about issues now before the state Legislature. “Community conversations are a great way to have an open, honest discussion on the issues facing the state and Darien,” Duff said in a news release Friday.